A rare, fully restored, 9ct vintage Rolex Precision ‘Oversize’ gentlemans dress watch in immaculate condition from 1951. Rolex Precisions were produced in several sizes in the 1950s, starting at 30mm in diameter, excluding the crown. 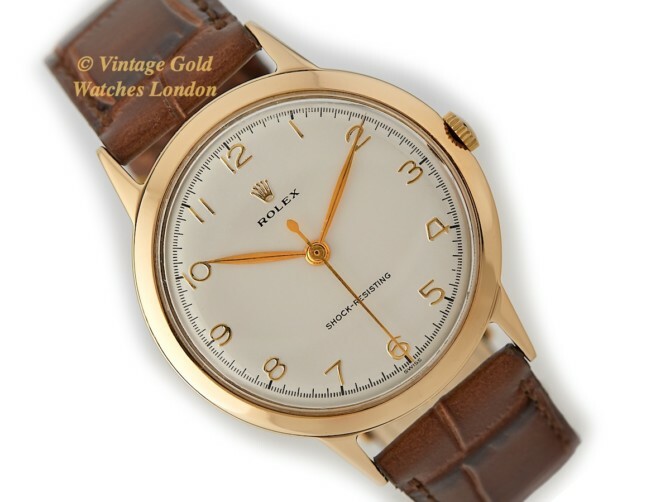 The majority were 32 and 33mm with some 34mm but very rarely, Rolex or their UK case makers produced 35mm models and even rarer 36mm, such as the example we see here. These are highly sought after watches because the seemingly small difference in size does add significantly to the ‘presence’ and value of the watch. The Silver-White dial with the very popular 1 – 12 raised gold numerals also adds to the desirability of the watch, especially when found in such superb condition as the example we see here. The beautifully restored, classic Silver-White dial with raised gold 1 – 12 numerals is one of our most popular and sought after dial designs. It carries the earlier small Rolex signature coronet, which along with the correct, original ‘Leaf’ hands, adds to the unmistakably early 1950s charm of this watch. The dial colour changes from grey to silver to white, depending on how it catches the light, as we have attempted to demonstrate in the photographs. This is the original dial which has been sympathetically restored to the very highest standards by our dial restorers, who are considered to be the best in the UK. This watch carries its original high-grade Rolex Calibre 710, 15 Jewel movement, which as can be seen from the photographs, is in spectacular condition. The movement has been completely disassembled to each of its component parts then cleaned, inspected and rebuilt, using only original Rolex parts where required. It was then reassembled and oiled with Rolex specified oils. When tested and calibrated on 11th April ’19, following its restoration, this watch was running to within 7 seconds per day which is outstanding for a vintage watch of this age. The movement is all correctly signed ‘ROLEX’, ‘SWISS MADE’, and ‘15 Jewels’, along with the Calibre number 710. These movements are strong, accurate and very reliable, making the watch appropriate for regular everyday use. This particular movement is in top condition and with regular servicing, every 3-4 years we would fully expect this watch to run very happily for many more decades to come! We are therefore pleased to offer our 12-months warranty on this watch movement*. * Please note – our 12 months’ warranty is only applicable if the list price is paid. The substantial 9ct gold, wide bezel case measures 36mm in diameter, excluding the original signed Rolex crown. This makes this one of the very rare, largest Rolex Precisions. The watch case is in excellent condition with no scratches, dings or other marks visible to the naked eye. Inside the case-back, the markings are all correct and as expected; signed by Dennison, ‘Made in England for Rolex’. Dennison was one of the two top UK case-makers which made cases for Rolex, the other being D. Shackman & Sons. In addition, the case-back carries two reference numbers, 13871 and 414104, along with Birmingham UK 9ct hallmarks which date this watch to 1951. This watch case has been exceptionally well cared for and so after careful inspection, has simply required a clean and gentle polish to bring it back to its current ‘like new’ condition. As ever, our standard advice applies: vintage watches should be kept clean and dry at all times. A new high-quality Brown Crocodile strap has been fitted, along with a matching gold plated Rolex buckle. However, if a different colour or style of strap is preferred, please let us know and we will do our best to oblige free of charge. We carry tan, conker, dark brown and black in stock in plain padded leather, crocodile skin or lizard skin. We can also obtain most types and colours from our partners at ‘Watch Obsession’ within 48hrs. Although there are no original papers with this watch, the reference numbers, markings, signatures and hallmarks are all correct, dating this watch to 1951. Detailed particulars will be included with the receipt, along with our 12 months warranty*. A separate insurance valuation for the replacement value of this watch will also be provided at the time of sale. along with our unique ‘Lifetime Authenticity Guarantee’ which states: “If this watch proves to be anything less than totally authentic, or not as described, Vintage Gold Watches of London will offer you a full refund at any time”. The matching Rolex Oyster inner and outer presentation boxes as shown in the photographs are included in the sale. This is a truly first class example of a 195os vintage Rolex Precision which is ready to wear and completely practical for everyday use. If treated with care, it will make an excellent investment or heirloom piece and even though vintage gold Rolex prices have risen markedly recently, we still feel good examples such as this are still undervalued. As each year goes by and the world market for vintage gold Rolex watches continues to expand, prices will continue to climb ever higher. A word on our prices – We always try our hardest to acquire the very highest quality watches we can find, before restoring them to the highest possible standards. We then offer these at the fairest prices we can, taking into account our pre and post sales care and service. This approach means we will never be the cheapest, but nor will we be the most expensive. Indeed there are some well known stores in West London which are highly successful charging between two to three times the price you see here. We therefore consider our prices to be fair, given the quality of watches we have to offer. If you have any questions please call us on 0207 727 7095 or if calling from overseas, +44 7515 949250.